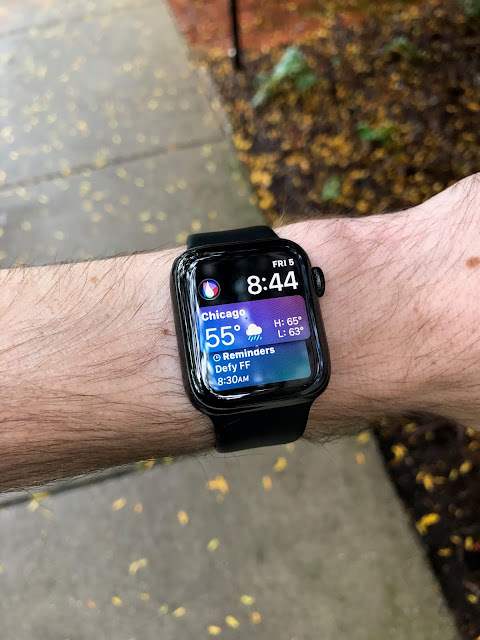 Editor's Note: Michael shares his impressions of the Apple Watch Series 4 as a running watch. He has owned all three version of the Apple Watch. So this 67:43 half marathoner and third year law school student at Northwestern picked up the 4 and put it to the test on the run. Despite never really “loving” the Apple Watch as a running watch and frequently falling back to Garmin, I’ve owned 3 different variants of it: the original (now colloquially “Series 0”), Series 2 (the first with GPS), and most recently Series 3 (the first with LTE Cellular). As an avid Apple user (though not without his grumbles), the opportunity to write this review for RTR was all the incentive I needed to pick up a new Series 4. I purchased this with my own money (and quite a large amount of it, as will be covered) and have tried it out over the course of a few days. 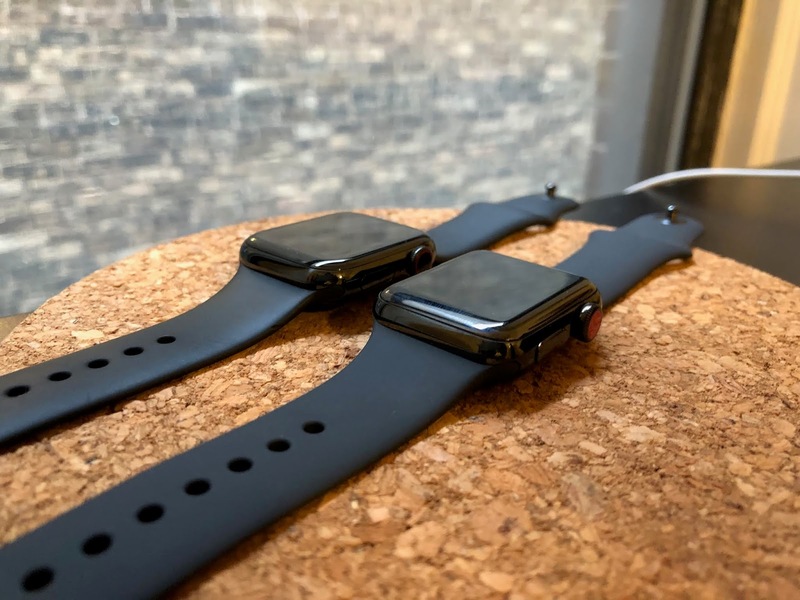 Because of my familiarity with the Apple Watch line, there was almost no learning curve to the Series 4 – anyone upgrading may well notice an increase in speed, especially from pre-Series 3 models, but nothing particularly new to master. Apple still doesn't allow for third-party watch faces, but does offer a massive array of customizable faces of their own. 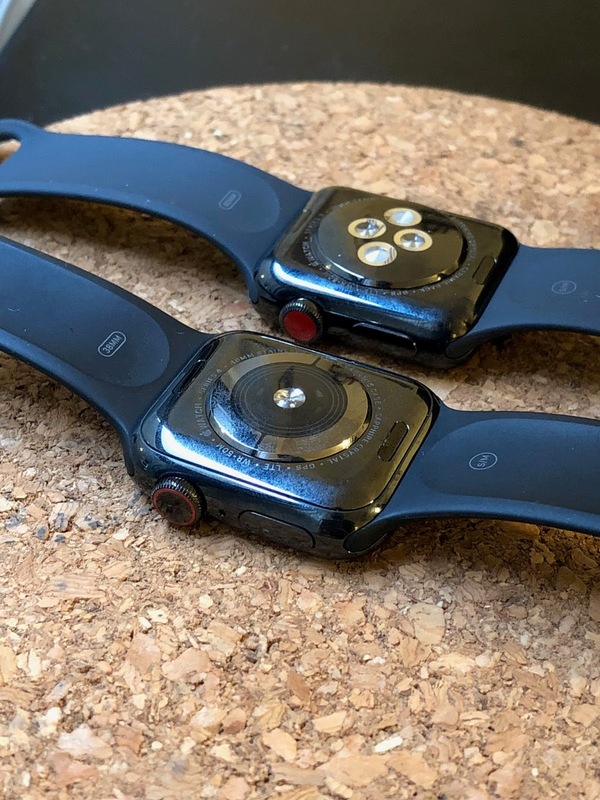 The most obvious visual cue when the units are off is the Digital Crown - the Series 3 LTE model (foreground) has a solid red paint job; the Series 4 LTE model has a more subtle red ring around the perimeter of the Crown. I purchased the 40mm Space Black Stainless Steel (LTE) Apple Watch, which ran me a whopping $699 + Tax. There are cheaper options available: the aluminum model (gold, silver, or space grey) starts at $399, and adds $30 if you want the larger, 44mm variant, and another $100 if you want the option of LTE cellular connectivity. Carrier rates apply, of course – most US companies offer $10/month tag-along plans which, while not overly expensive, bring the full force of taxes and fees that make it more like $15-20. Yikes. Most carriers (I’m on AT&T and have tried T-Mobile) allow the option of a free three-month trial, so there’s no real reason not to do that. The biggest change (literally) moving from the Series 3 to the Series 4 is the screen – now 30% larger across the two models. The former options were 38 or 42mm, but are now 40 and 44, with the smaller 40mm Watch available now toting larger screen real estate than last year’s 42, in a smaller package. This comes in handy when running – since the screen isn’t always on, but rather requires a tenuous wrist-flip, you have to glance at it at just the right time. Having more screen real estate to do so is a nice touch. The only reason I got the more expensive – perhaps overly expensive – stainless steel model is the sapphire cover that now wraps around the 40mm (up from 38mm) screen. I’m clumsy and I’m picky, which is a terrible combination, and there is little I hate more than scratched, dented, and malformed electronics. Fortunately, the sapphire cover glass on the Series 4 can slam into walls, door jams, car doors, handrails, light posts… even at running speeds. All of these I know from experience in just a few days of using the Watch (and can verify that after months with the sapphire Series 3, there wasn’t a single mark on the sapphire covering). Most will go for the aluminum – and rightfully so, especially as the stainless steel resale valuable is abysmal – but the stainless steel model, with its extra heft and shine, does feel a little more like jewelry. I have the stainless steel Link Bracelet (retail at a cool $450, and that’s with a price drop!) that I bought on Craigslist a few years ago for considerably less than that. It’s a terrific band, and one that I love wearing in a professional setting, but is representative of just how extreme Apple’s pricing can be. We can't always be running: the Apple Watch can be dressed up as well for a more "professional" look (the Link Bracelet here costs a cool $450 at retail, but check aftermarket for discounts on this, and all other, bands). The Series 4 (closer above) has a new rear sensor array with an improved heart rate monitor (HRM), as well as ECG capability and improved transmission of cellular signals. I was unable to test the ECG, nor did the cellular signal seem improved. Note that the bands are reversed (the 38mm watch has the 40mm band) to denote the backwards compatibility of all Apple Watch bands. I won’t run through the tech specs here – there are dozens, perhaps hundreds of tech-centric reviews of the Apple Watch that can do it better than I. Some notes on other hardware pieces, though. The battery is rated to last as long as Series 3, despite the bigger screen. I’ve found that largely true. You can get 2 days if you don’t run, I’m sure, but with an hour of GPS on, you’re charging by 10pm. If you’re using GPS and streaming Apple Music to your Airpods or other Bluetooth earphones, you’re probably charging at your desk. It is a pretty amazing experience, to set off on a run with only your Watch and some earbuds and be able to queue up any music you want (provided you’ve paid the cellular bill), but it really drains the juice. 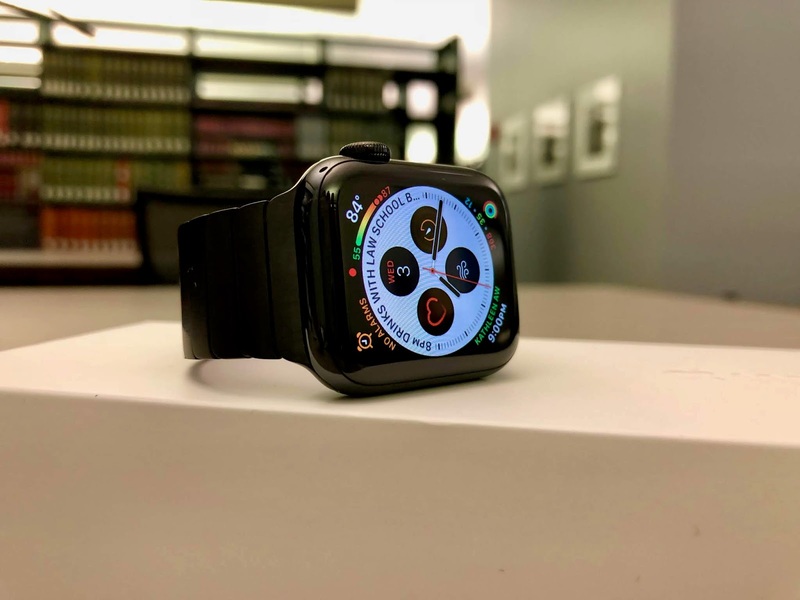 As a general rule, the Watch is akin to your iPhone in battery usage – have the screen on more, it’ll drain faster – except that standalone LTE on the Watch is a battery killer, and will drop you 10% in an hour, before the GPS comes in. If you’re battery conscious (who isn’t? ), download your music to the Watch ahead of time and play to your BTT headphones that way. 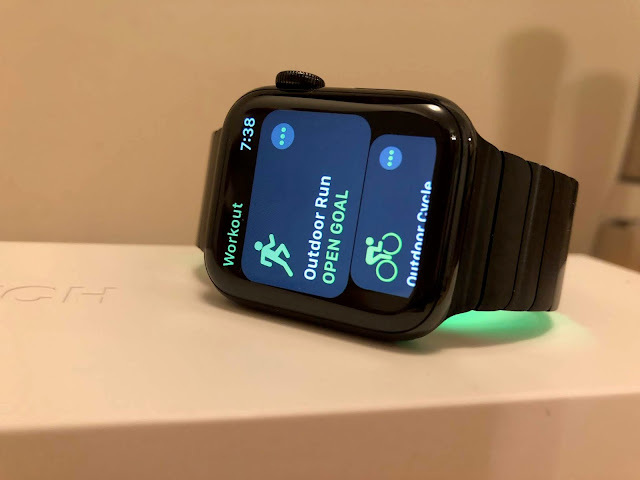 Another running-specific hardware note – the Series 4 has GPS, GLONASS, and GALILEO. This new satellite array supposedly tracks better than the other two, as has been available a while on Garmin’s Fenix 5 Plus line. The Series 2 and 3 had only GPS and GLONASS and I never had an issue getting a track, but it’s a welcome addition, nonetheless. Of course, it has an optical heart rate sensor as well and (coming soon in the USA), an EKG functionality. The HRM is continuously recording only when recording a workout (here, the Workout App is open, thus the green HRM is ready to go). The Apple Watch comes with a stock “Workouts” app but, being an Apple product, accepts apps downloaded from your iPhone’s App Store (oh yeah, you can only use an Apple Watch with an iPhone – sorry, Android users!) 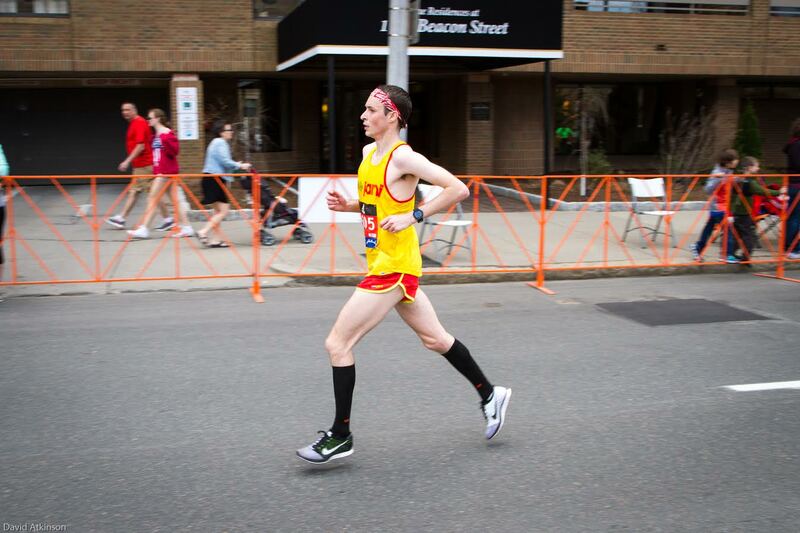 for a broader running experience. In my experience, the Workouts is the smoothest, most consistent experience. It’s locked down (you can’t natively export workouts to Strava, Garmin, or others) but there are a few apps – I use the lovely “RunGap” – that bridges the gap and let you upload from Workouts to Strava with only a tap or two. Using the app is straightforward – you can even direct Siri to do it for you, with “Hey Siri, let’s go running,” or some variant thereof. Pretty slick, if Siri can understand what you’re saying (I kid, sort of – they’ve moved the microphone array around, and Siri is a bit better than on the previous generations). Siri and LTE also mean that if you’re running somewhere foreign to you, or your run starts to tank, and you need a ride home, you can call an Uber (or your mom) without your iPhone. As someone who has never run with my phone (iPhone 8+ is basically a second me, in size and weight), this is a nice little safety feature. In a tunnel, the Apple Watch leaves gaps that are filled in later by software. 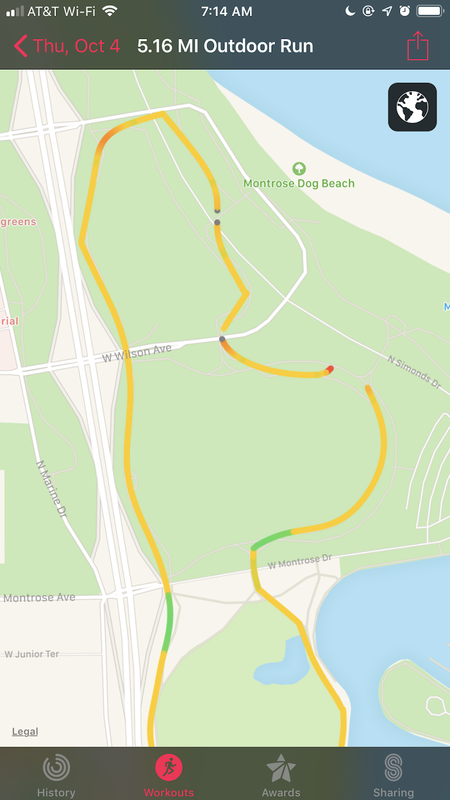 Note also the color variance, denoting pace changes (generally hills or tight turns). 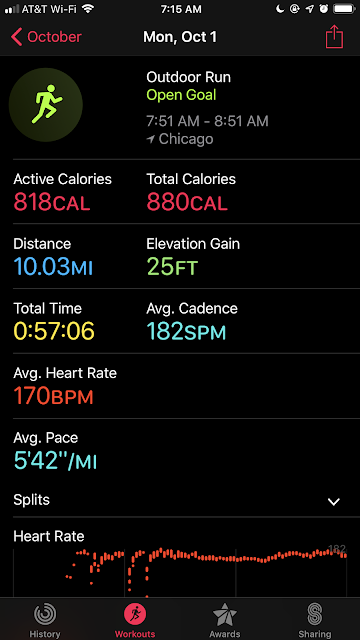 Part 1 of the metrics available off the Apple Watch - this is a route my 645M measured as 10.00 miles, so very close on the Apple Watch Series 4. Metrics, Part 2. The HRM measurements drop off at stoplights - though, as you can see, it took a mile for the HR to record at all. This has not been an issue in future runs, so perhaps a one-off issue. The same run, imported to Strava via RunGap. Strava applies their own algorithm to the GPX file so there are some changes, but it's largely the same. The same 10-mile loop. Strava shortens most imported runs, for whatever reason, and added a minute of time - there is still some confusion r.e. running time versus stopping time. I tend to trust what Apple pulls off, and then just deal with whatever Strava wants to add. Another huge runner-bonus here – Apple Watch doesn’t require you to wait for a GPS lock before you start going, so all those freezing cold minutes in January waiting for that damned bar at the top of your watch to turn green are, theoretically behind you! The Watch back-calculates the position you started using your Watch and iPhone in tandem, supposedly. I’ve had some miscalculations, but it gets it right more often than not – and is often more accurate that my Garmin 645M in starting position, even with the “GPS-lock” bar displayed. A downside, speaking of those winter runs – touchscreen only, here, so you’ll need special gloves (or none at all) to manipulate the Watch. You can play/pause your run by pushing both of the buttons on the side of the Watch (the “Digital Crown” and the “Side Button”) in tandem. It works well enough, but I’ve just gone to auto-pause and the digital smoothing of those stops in post-production processing. A few other notes: Workouts now allows you to set pace zones, so it’ll warn you if you’re ahead or behind a certain pace you’re targeting. There’s also a “rolling pace” metric, which shows you your average pace over the last mile, specifically. Not useful to me, as far as I know, but it’s there. 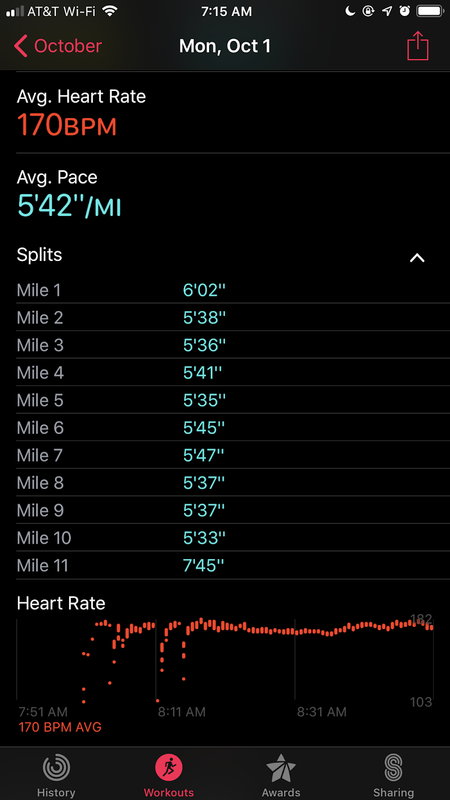 Runs are reasonably exact, as far as I can tell on the Series 4, especially compared to my Garmin Forerunner 645 Music, Forerunner 10, and Series 3. The output is this weird, overly-smoothed map that shows green when your pace was faster than average, and red when slower. It’s actually a somewhat useful representation, because you can see that on tight turns you lost a little time, etc. It also cuts out bridges or areas where it lost GPS-track and supposes them in after-the-fact, which is better than those runs (we’ve all had them) where running under a bridge cost your GPS track to run all the way down the block and back in some horrific jagged array. Apple clearly prioritizes aesthetic over functionality in Workouts, but that’s not all bad, fortunately. Some downsides of “Workouts” – you can only take a manual split by double-tapping (with your finger) the face of the Watch. This works approximately never, and if I’m on the track, I’m bringing my 2003 Timex Ironman every time. The mile split markers also have such a weak “taptic feedback” that I miss them half the time if I don’t know to be paying attention. Another negative – once a run is done, it’s gone from your Watch. You can see how far it was, but no other metrics – you’ll need to pull out your iPhone for that. A little frustrating when you just want to remember what that last split was. What if you don’t want to use Apple’s Workouts App? Strava has their own native app, of course, but in my experience, it’s towards the bottom of the list. You can’t use the two-button-push to pause, so you’re relying on a touchscreen or an auto-pause that seems to trigger every time you turn your wrist to check the time. No, really – this is the most sensitive auto-pause I’ve ever used. There are numerous complaints on the Strava forums about this, but I don’t know it’ll be cleared up any time soon, considering it’s not exactly a new issue. 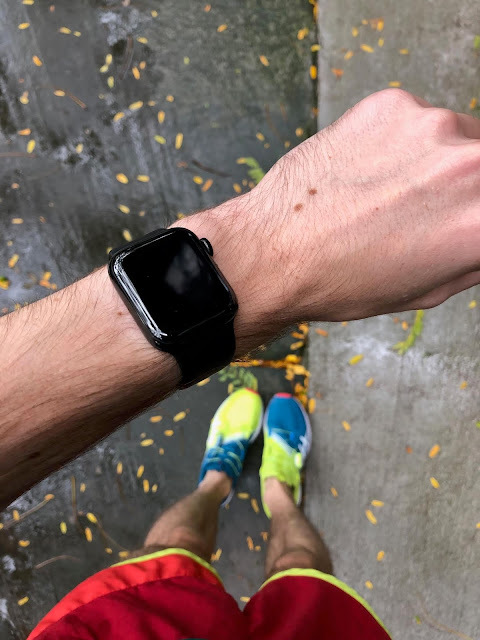 Nike Run Club (Nike+) has a Watch app, and it’s one of my favorites – though I can’t stand the voice feedback they provide at the mile splits (it’s now toggle-able, so no worries). Exportation is limited to Nike+… but sly developers, as with RunGap, have found ways around it. I have an app called N+ Exporter than allows me to post Nike+ workouts to Strava with all metrics conserved. The other app I’ve tried is iSmoothRun, which came highly recommended, but was not (to my use) a little buggier than I’d like. It does allow for workout-specific features (it has a ‘lap/split’ button) but it crashed on me during a run, which is really all I needed. Marathon notwithstanding, I think the Series 3 and certainly the Series 4 have moved the Apple Watches away from “smartwatch” and into “fitness watch” territory. Does “fitness” mean “running”? Not necessarily – this is a watch fraught with compromise. Touchscreens are undoubtedly worse than buttons, especially if you’re (a) sweaty or (b) cold, which means you basically get early, early Spring and late, late Fall in Chicago where this is truly usable. But even with that, it’s terrific to have a Watch than can jump from your 10-mile morning run to your lunch meeting without more than a band change (if that). Moreover, with faster processors, better batteries, and bigger, bright screens – the Watch line just keeps improving. The most desirable change is, and will forever be, an always-on display. That’s hard to do given the nature of OLED screens "lighting up" and thus using battery to display unlike trans reflective displays, but the mid-run wrist-flip to check your time and pace is one that takes some getting used to and (even when that’s accomplished) is considerably worse than, you know, just looking at your wrist on every other watch. At $699, it’s not an easy sell to all but the Apple devotees (or suckers, depending on who you ask). That said, for $399, the aluminum model without the LTE capabilities is a good bet if you just want a sports watch that is fun to have off the trail, too. That slots it at least somewhat competitively with Garmin’s Vivoactive line and Fitbit’s Ionic, in which case you’re making compromises either way. Samsung has a Galaxy Watch, now, and Google’s Wear OS is on several GPS-capable models, most of which undercut the Apple Watch in price. Garmin’s Fenix 5 Plus line is more equivalent in pricing, especially to the stainless models, but is a world apart in terms of features and (especially) battery. All that said, the Apple Watch is, functionally, in a class of its own. No other Watch has the breadth of features, of style options, or of connectivity as the Watch. Prospective buyers need to weigh the price, for one, and to what extent they need the perfect running watch (not the Apple Watch) versus a good-enough running watch that can do a hell of a lot more, too. That’s the Series 4. The Apple Watch was a personal purchase. The opinions herein are entirely the author's. Great and realistic review - thanks!. I upgraded from an original Apple Watch to the 4 and the difference is amazing. But, I also still struggle with it as a better all around running watch than my Garmin Fenix because of battery life, touch screen, and syncing/ecosystem. I also get a bit obsessive over heart rate data even when not running which you can configure a Garmin watch face to show near real-time heart rate which helps monitor recovery, stress, etc. I have been using a private Strava account for so long to log my runs and also track my shoe mileage but the Apple Watch Strava app is not near as good as the native workout app. How did you get it to all link together? I tried the RunGap app but I guess can’t figure out how to get it to sync apple workouts to Strava. Impressive workout and PR’s. I’m much slower but still enjoy the process and playing with gadgets! 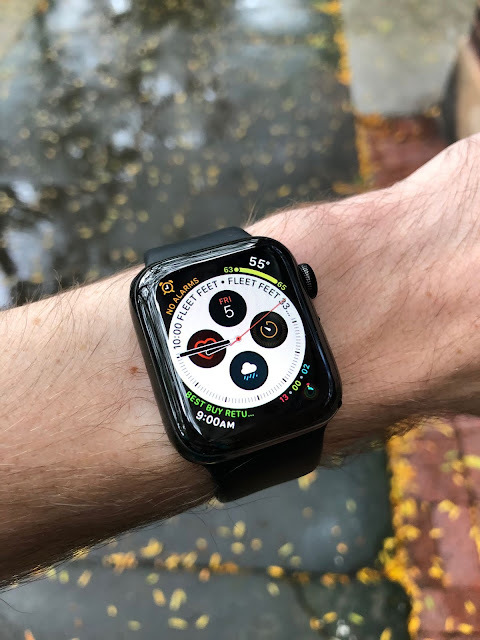 Thanks for the great review Michael, just wondering what is your experience with the battery life for Apple Watch 4 (40mm) when you turned on LTE, GPS and Heart rate sensor for running? My Apple Watch 3 (38mm) could only last for 3 hours when everything is on (except streaming music). Unknown - I agree, the Workouts app is superior to Strava for AW. Hopefully Strava makes an update but I'm long past holding my breath. Synching RunGap and Strava is confusing at first but ultimately quite easy. RunGap requires a small ($2.99 for 3 month?) subscription. Look under "Swag Bag" on the sidebar. I'm quite adverse when it comes to paying for apps, but I do subscribe to this one. Once you set that up, you let it have read access to your Workouts data (Apple Health data) and write access to Strava, and push it over. I have it set up manually so I can look it over, but I believe you can do it automatically as well. Anonymous - I don't often do quite so long of runs, so I don't have anything definitive, but in my experience an hour of running with LTE, GPS, and HRM drains about 10-15%. I have it turned on DND during Workout, but not the specific low-power mode - have you tried that? Or, if you don't think you need to use the LTE modem during exercise, you could always toggle it off from the Control Center (bottom swipe up) and toggle it on should you need. As I suggested in the review, the battery and the touchscreen are the two significant negatives when compared to a Garmin - and the battery is especially an issue when on standalone LTE. Demian - (Sorry for the delay). I've just picked up a Stryd and am excited to, no pun intended, put it through its paces with Apple Watch. Is there an active watch out there where you can actually replace the lithium battery when it finally dies? You can't do that with the Apple Watch. I've heard of people doing it in the Garmin Fenix line - it wasn't a Garmin-authorized repair, but you can buy the parts on eBay. Have not tried myself. Apple can also replace the battery, though it may cost you, depending on the warranty status. this is a great review, thank you. I've had a Garmin Forerunner 230 for the past 11 months and it hasn't correctly recorded a run once, getting the GPS wrong by up to 5 miles in a 10 miler run! It's been replaced twice by Garmin but alas, still no luck. I'm currently in the throes of 'new watch' research, and totally conflicted to give Garmin another go with a different model, or to risk it with an apple watch. As i'm getting into more triathlons noone seems to be able to give a decent comparison between them? Or you can press both the Digital Crown and the side button at the same time. To resume, press both buttons again. You can set indoor and outdoor running workouts to automatically pause when you stop moving. On your iPhone, open the Apple Watch app, tap the My Watch tab, then tap Workout > Running Auto Pause. I have used the 3 and the 4. The 4 is a substantial upgrade over the 3. But, it is far from being a running watch, per se. Does that mean to leave it at home for runs? Not necessarily. I will take mine on all runs for my music and of course to use as a phone for emergencies (had someone try to attack me this summer). I ran Baystate with it on one wrist playing my music and with my old Garmin 235 on my other wrist tracking. It worked great and was much better than carrying the weight of the phone. Now, I will also take just my Apple Watch on easy and recovery runs as I run on time and not distance. I am sure it is slightly inaccurate. But, I am not too worried as I know it is the effort that matters during these workouts. I hope this helps.